During the #JanuaryWhole30, we received lots of questions about fermented foods. You’re curious about sauerkraut, kimchi, pickled veggies, kombucha and their place on your Whole30/life after your life after Whole30 plate. It seems like we’re currently experiencing something of a fermented foods revival, and a variety of fermented foods and beverages are showing up everywhere from farmers markets to big brand grocery stores—and in all likelihood, also finding their way into your home. Whole30’s own Melissa Hartwig had the opportunity to interview New York Times bestselling author Sandor Katz; a fermentation expert, James Beard Award-winner and author of Wild Fermentation and The Art of Fermentation. Melissa asked Sandor your questions (collected on Facebook and Instagram) about fermented foods and how to incorporate them into your healthy Whole30 lifestyle. 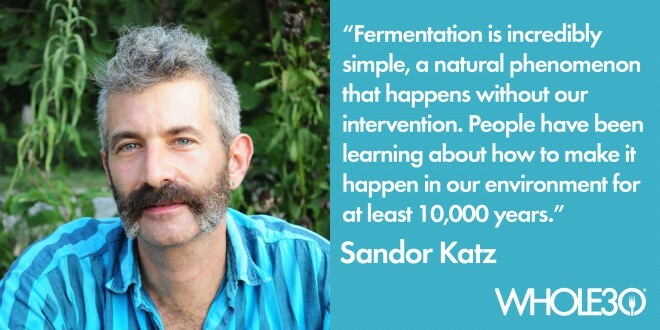 Fermentation is the transformative action of microorganisms, which results in something delicious. Humans didn’t invent or discover fermentation—it happens spontaneously. Our accomplishment is creating vessels to make these processes happen on our terms. Bread, miso, sauerkraut, wine … these foods are produced by invisible life forces, microorganisms, which adds a sort of alchemy to the whole thing. By eating a variety of live fermented foods, you promote diversity among microbial cultures in your body. Biodiversity is increasingly recognized as critical to the survival of larger-scale ecosystems, and it is just as important at the micro level. Your body is an ecosystem that can function most effectively when populated by diverse species of microorganisms. When you ferment foods and beverages with the wild microorganisms that are present in your home environment, you invite these microbial populations to enter your diet and your intestinal ecology. You become more connected with your environment and the other forms of life around you. 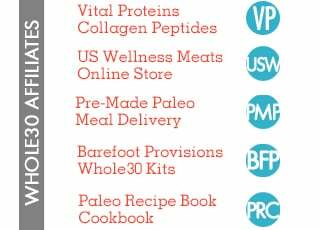 What kinds of foods can you ferment on a Whole30 or Paleo diet? Any kind of food you can eat, you can ferment! There’s nothing that could nourish us that can’t be fermented. 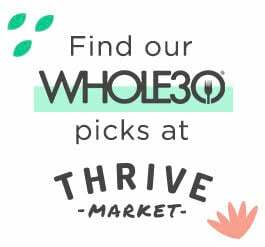 You can regularly include fermented vegetables and fruits in a Whole30 diet, such as sauerkraut, kimchi, or pickles. Kombucha is a fermented food as well. Fermentation sounds complicated and science-y. How easy is it, really? Shred or chop the vegetable to expose as much surface area as possible. Add salt in order to release the natural juices. Pound or squeeze the vegetables to bruise the surface and pull juice out. Compress it into a vessel. This forces the liquid up so that the cabbage is under the protection of its own juices. Wait. The amount of time varies depending on the environment that’s created, but you should taste it every day or two. Generally a tangy taste will develop within a few days. How do I know if my home-fermented foods are actually fermenting and not just rotting? People are fearful about fermentation; they project their anxiety about “bacteria” onto fermented foods. Statistically, eating sauerkraut is actually much safer than eating raw cabbage! In recent years we’ve heard about produce being contaminated by harmful bacteria on their way from the field to the grocery store. Let’s say you were to make sauerkraut from contaminated cabbage. Once you create the right environment, it will acidify and knock out anything pathogenic. None of the organisms we associate with food poisoning can survive in this environment—the contaminants cannot complete with the beneficial organisms that are so plentiful in fermented foods. When you ferment at home, you have to trust your senses. Of course, things can go wrong. If you don’t check in on your veggies and the surface is exposed to air, you may get mold. This is generally benign, and you can simply skim off the ugly top layer and evaluate what’s beneath. If it looks good and smells good, it’s probably fine. How long will a fermented food last if you keep it in an airtight container? How about once you open it? It depends on how much air space is in the container. In a completely full, airtight container, a salty acidic food can last for years in the refrigerator. Your fermented foods will probably last longer than you need them to. Think of it in terms of seasonal eating; the practical value of fermentation is storing food through the winter season until fresh food is available again. I’ve heard some commercially sold “fermented” foods are actually flash steamed for packaging. Do these still have the same benefits as fermented at home? 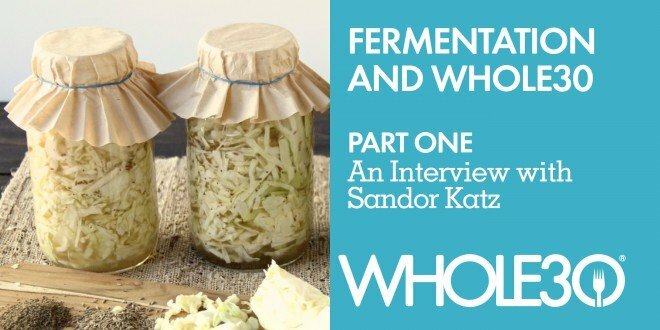 Producing fermented foods with your hands in your kitchen makes for a unique microbial quality to your sauerkraut, but some people don’t have the inclination or time to do so. They can still derive the benefit from bacterially-rich foods by purchasing fermented foods from high quality local or regional brands who are producing sauerkraut from fresh, local vegetables.  There are people making excellent versions of them all around the U.S. To find producer in your area, reference the list on my website. We heard from many Whole30’ers who are experimenting with brewing their own kombucha. They’re wondering why home-brewed kombucha doesn’t always develop the same fizzy-ness that store-bought brands do. There are two stages to making kombucha. The primary fermentation is done in an open vessel with the “mother” or SCOBY, unflavored tea, and sugar. The mother is very sensitive, and there can be no flavoring in the tea that is used. After the primary fermentation, you can add fruit or vegetable juice, and put the liquid in an air-tight vessel. It will continue to ferment and will generate carbon dioxide, which makes bubbles. The fruit or veggie juices add sugar, and the more sugar you introduce, the more you’ll enable carbonation. What happens to the sugar you add … is it all used up by the bacteria? 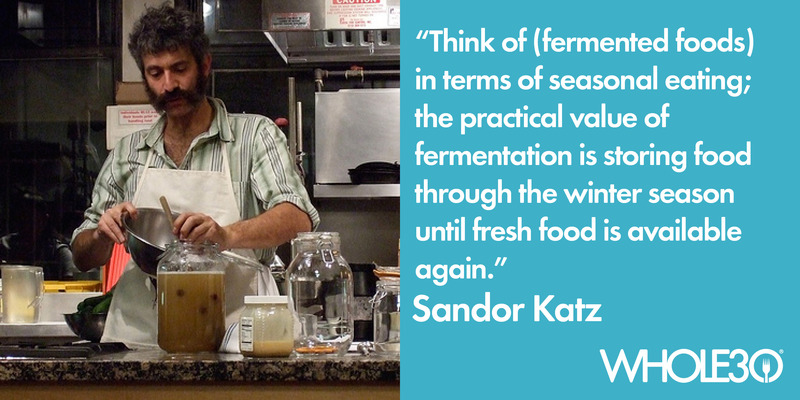 Interested in learning more about Sandor’s approach to fermentation? Check out his books, Wild Fermentation, and the New York Times bestselling The Art of Fermentation, and visit his site, Wild Fermentation. Stay tuned for Part 2 next week, where Sandor shares his favorite sauerkraut recipe, and we share ways to incorporate fermented foods into your Whole30 using recipes and ideas from our community. Header Image courtesy of barerootgirl.com. Post images courtesy of Sean Minteh and wildfermentation.com. Bio image (c) Catherine Opie 2015.